For Christmas I received this beautiful Zara bag. I am officially in love. I feel the need to hold on the the wintery months. So I am not going to be opening my purse to any s/s13 items just yet. I am also having major Post-Christmas blues, what with the hideously sore throat and lack of Christmas songs. 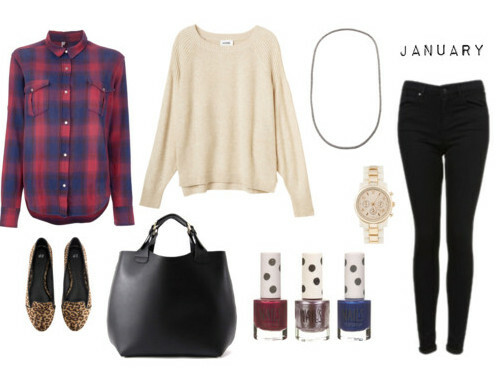 January and February is for snow and buying beautiful checked shirts, dark metallic nails and simple knits. i hope your new year was lovely, charlotte. miss you! especially right now, because just about a year ago, i was there with you! take care : ) cheers! I definitely had a few days of post Christmas blues! Eurgh. Hope your feeling cheerier soon! Beautiful little wishlist. I have been wanting a new checked shirt since I saw the one in Monki when we were there! I have been borrowing David's one that is similar, but a little big, hehe! oh i was just writing about my post christmas blues! isnt it awful! i literally felt it right after boxing day dinner, I almost felt like crying.